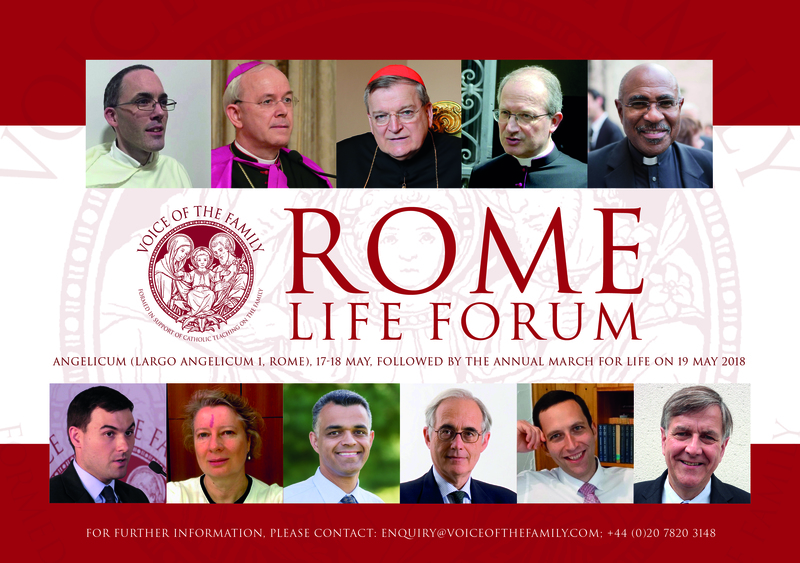 Voice of the Family is pleased to announce the fifth annual Rome Life Forum, which will be held at the Pontifical University of St Thomas Aquinas (the Angelicum) from 17-18 May 2018. It will be followed by the Rome March for Life on Saturday 19 May. The conference will take as its theme “The True Understanding of Conscience”. We will explore both the authentic teachings of the Church on conscience, and the threats posed by the false theories now being widely professed within the structures of the Church. A correct understanding of the nature of conscience is an essential foundation of a civilisation which truly values and protects the family and innocent human life. The Forum will be addressed by a number of prestigious speakers including: Raymond Cardinal Burke, Bishop Athanasius Schneider, Mgr Livio Melina, Fr Thomas Crean OP, Professor Roberto de Mattei and Professor Isobel Camp. The event is sponsored by Famiglia Domani, Family Life International NZ, LifeSiteNews and the Society for the Protection of Unborn Children. The Forum is open to all those who have leadership roles in the pro-life movement or in movements concerned with the defence and diffusion of Catholic moral and social teaching. More information, and the booking form to reserve a place, can be found here.